Normally, I would be overjoyed. I love lilacs. It's my all-time favorite flower and scent. The smell takes me back to my childhood and conjures a time of ease and peace. It's a shame they are in bloom for only a couple of weeks, but that makes their time all the more delicious when it is here. But, it's early April and they are more than a month early. My late season tulips are blooming along with the lilacs. We still have a month of dicey weather to get through before I can reasonably decide to fill the pots with fresh soil and hope for flowers. This is moderately depressing. 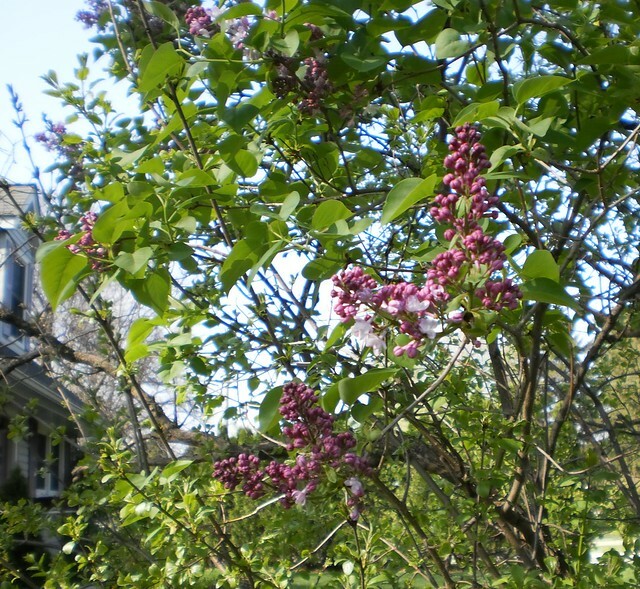 The lilacs blooming has gotten earlier every year that I've lived in the house. It was after May 15th at first. Then it got to be Mother's Day and, just recently, it's been around the first of May. March's unseasonably warm weather has through nature into a tizzy. It doesn't know what season it really is. I have to bring the geraniums I put out on the deck into the house tonight. We're having 'normal' April weather over the next few days. So, I'm going to have to relish these blooms now, while I can. May is going to seem empty of scents without the usual lilacs. If you need me, I'm in the bush, smelling the flowers.